By Matt Burdett, 21st August 2018. 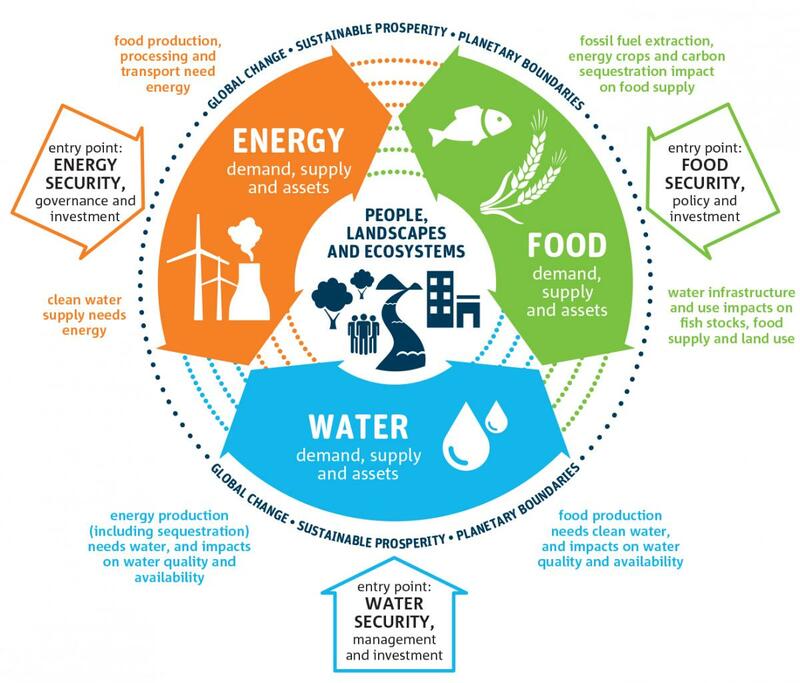 The diagram below shows some of the links between the issues of food, water and energy. The key idea behind the nexus is that each one affects the other. A change in one area will have an impact on the other two areas. The food-energy-water nexus, with some of the links between each feature identified and explained. Source: IWA, 2018. Sustainable Development: The Water-Energy-Food Nexus. In geography, the word ‘security’ can be added after another word to indicate whether there is a reliable supply of the feature. Water security is about a reliable supply of water; food security is a reliable supply of food; and energy security is a reliable supply of energy. At pre-university level, we need to be aware of some more specific definitions of each of these terms. Water security: “the capacity of a population to safeguard sustainable access to adequate quantities of acceptable quality water for sustaining livelihoods, human well-being, and socio-economic development, for ensuring protection against water-borne pollution and water-related disasters, and for preserving ecosystems in a climate of peace and political stability” (UN University, 2013). Food security: “Food security exists when all people, at all times, have physical, social and economic access to sufficient, safe and nutritious food which meets their dietary needs and food preferences for an active and healthy life” (FAO, 2018). The concept of national security normally refers to the safety of a nation – i.e. whether it can defend itself against attack. However, in this context, national security refers to the ability of individual countries to meet their water, food and energy needs both now and in the future, within the confines of the definitions above. It’s important to remember that it is the links between aspects of the nexus – food, energy and water – that is important. But, for simplicity, some links are explored in a linear manner below. In some cases, problems can be solved by linking these areas together, but in others, one issue can cause problems for another. Water security has links to both food and energy security. If there is a shortage of water, irrigation will stop and agricultural products (food and also things like cotton, biofuels and timber) cannot be grown. Most countries rely on thermal power stations whereby fossil fuels or nuclear energy sources are used to heat water as part of the production of electricity. Meanwhile, the development of a safe water supply (through dams and pumping water from aquifers) can affect the amount of land available to grow food; but it can also double up as a good source of hydroelectricity. Food security has knock-on effects on both energy and water, because without a healthy and active population, the country will not be able to work to supply either of them. On a small scale, excess food that would otherwise be wasted can be recycled and composted during which the gases produced can be harvested and used as an energy source (albeit on a small scale). Over-cultivation (growing too much on a piece of land) can draw too much water from the environment, causing desertification and salinization. Also, increased food production can lead to higher pollution from the use of fertilizers and greenhouse gas emissions. Energy security ensures that infrastructure projects to improve water and food supplies can go ahead. But, the way in which that energy is produced can lead to water pollution. But a switch to biofuels would mean less food production and lower food security. The concept of a ‘nexus’ is useful for identifying the links, but can be criticised as an approach. The table below summarises some of these positive and negative issues. FAO [United Nations Food and Agricultural Organisation) 2018. Food security statistics. http://www.fao.org/economic/ess/ess-fs/en/ Accessed 21 August 2018. IBDP [International Baccalaureate Diploma Programme], 2017. Trilingual glossary of geography terms for the Diploma Programme, Version 1.1.
http://xmltwo.ibo.org/publications/DP/Group3/d_3_geogr_gui_1702_1/pdf/Geography_glossary_e_f_s.pdf?doc=d_3_geogr_gui_1702_1_e&part=1&chapter=1 Accessed 21 August 2018.
International Energy Agency, 2018. Energy Security. https://www.iea.org/topics/energysecurity/ Accessed 21 August 2018. IWA [International Water Association], 2018. Sustainable Development: The Water-Energy-Food Nexus. http://www.iwa-network.org/learn/sustainable-development-the-water-energy-food-nexus/ Accessed 21 August 2018. Nagle and Cooke, 2017. Geography Course Companion. Oxford University Press, Oxford. University of Sheffield, 2018. The Domestic Nexus: Interrogating the interlinked practices of water, energy and food consumption. https://www.sheffield.ac.uk/geography/nexus Accessed 21 August 2018. UN University, 2013. Water Security & the Global Water Agenda: A UN-Water Analytical Brief. http://www.fao.org/3/a-i2930e.pdf Accessed 21 August 2018. Print out this page. Take one colour and highlight the negative links within the nexus (where one thing has a negative impact on another) and with another colour highlight the positive impacts. Which is greater?